The young buck has been spotted around the city still sporting his hammock headwrap. Sep. 23, 2017 4:15 p.m. Prince Rupert RCMP spent 30 minutes freeing a young buck whose antlers were caught in a backyard hammock Aug. 14. The officers were called to a 6th Avenue East home where they eventually were forced to cut the animal free from the hammock after several failed attempts to calm him down. Video taken of the scene show the deer fleeing into the woods with large sections of the hammock still tangled in his antlers. 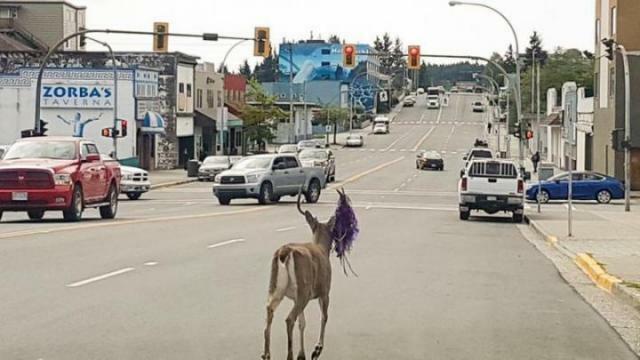 In the weeks since, “Hammy” the deer has been spotted in and around Prince Rupert, with residents snapping photos and posting them to social media. Here are a few of the highlights.